[UPDATED POST as of 7/5/12: For the latest, go to the bottom] The number of LGBT pride month marches, rallies and events taking place in throughout Latin America to coincide with the anniversary of the the Stonewall riots of 1969 in New York City has grown exponentially each year making it difficult to keep a tally of all events. Pride in the Dominican Republic has a relatively short and rocky history. Some say there have been pride-related events going back to 2001 but during the first few years most of them consisted of academic gatherings, art exhibitions and roundtables. 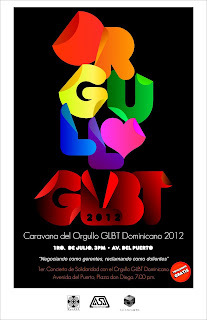 Pride didn't truly go public until 2006 when an estimated 250 people took over the Duarte Park in downtown Santo Domingo although media didn't catch wind of what would become an annual event until the next year. In the meantime Amigos Siempre Amigos (ASA), which had put together some of the earlier pride forums finally took to the streets in 2008 with a "pride caravan" which has also become an annual event. This year, ASA announced that he caravan would take place on July 1st and would conclude with a concert featuring more than 20 performers. They also said that the theme of this year's carava would be "Strengthening Dominican democracy towards full inclusion of all citizens." Unfortunately, as Imágenes Dominicanas reported on Monday, the caravan almost never left the starting line. Before the caravan got going, several people were seen carrying a couple of large rainbow-colored flags made to look like the Dominican flag. Police authorities who were monitoring the event took issue with the flags and said they showed a lack of respect for the country and for its patriotic symbols. Allegedly, the police confiscated the flags but the crowd refused to leave without them. The police finally agreed to return the flags as long as organizers agreed not to show them. None of the photos or videos I have seen of the event show the flags in question so it appears the organizers heeded the police warning but once the caravan got going demonstrators were stopped once again as police this time asked that all Dominican flags be removed, rainbow-colored or not. It's exactly because we are citizens of this country that today we are reaffirming - in our own special style - the rights established by the Constitution of the Republic that also belong to us. Nobody can keep us from using our flag in an event that is meant to defend our human rights because it would be like telling is we are not Dominicans. We are Dominicans! I usually carry my ID card, which nowadays seems to be the fashionable thing to do, and it says I am a citizen of this country. So tell me, in what way have we disrespected you. The officer in charge never gives him a reason and keeps repeating that the flag be taken down. 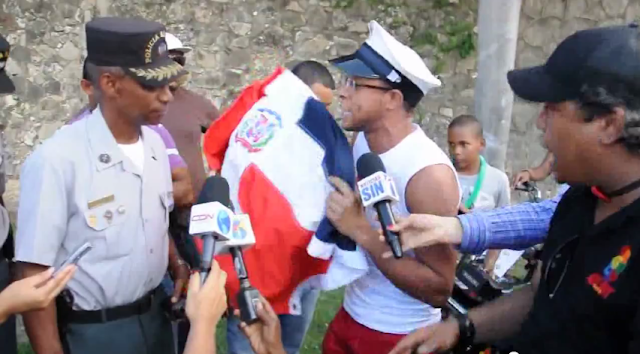 As the video progresses you can see ASA's director Leonardo Sánchez, in black, and other members of the crowd demand the police officer take out a copy of the Dominican constitution and show them where it says that they cannot carry the flag. As a number of journalists look on, the officer finally relents and lets the marchers continue with the flag. The caravan finally completed its route and my friend Monaga, who blogs from the Dominican Republic, reports that the rest of the rally and the concert was a resounding success. I actually found out about the confrontations as they were happening taking place via Puerto Rican transgender rights activist Samantha Love and tweets from @No_Homophobia_RD. 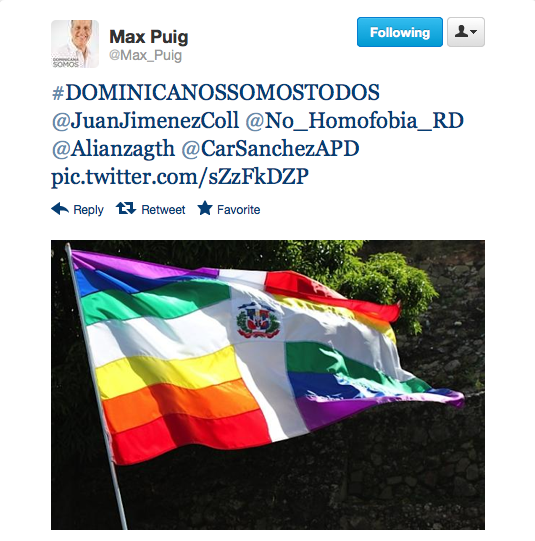 It's interesting to note that Max Puig, a former Minister of Labor and the Environment under former president Leonel Férnadez, tweeted a photo of one of the confiscated rainbow Dominican flags with a hashtag that read "We are all Dominican" in Spanish. Mr. Puig quit the Fernandez government in 2010 accusing the president of corruption and launched an unsuccessful presidential campaign. During that campaign he met several times with members of the LGBT community and promised to include them in his policies should he be elected president. Hate from the pulpit: That same day Hoy reported that Cardinal Nicolás de Jesús López Rodríguez had held a press conference after his Sunday church service and exploded in anger when asked if he felt the church was discriminatory towards the LGBT community. Hoy said the Cardinal expressed regrets for anyone in the gay community who might feel marginalized or mistreated by the Catholic church but then said the church had a right to take certain stands based on its longevity in the island as opposed to up and coming groups wanting to change how things were done. In what the paper described as angry tone, the Cardinal said "Hold on a second, hold on! The Catholic church has been here for more than 500 years, whoever tries to come now let them try to join us". He then stopped taking questions and went back inside his church. The Cardinal is no stranger to vitriolically homophobic outbursts and actions. 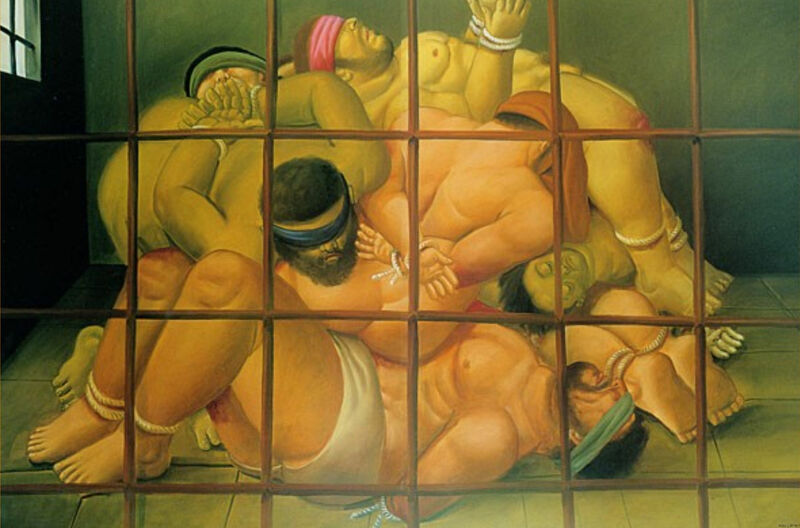 In 2007 during an interview with El Nacional, he referred to gays as "maricones" or faggots. Unsurprisingly, he also has deep influence over the island's government and police authorities. In April of 2010 I wrote about a police crackdown against gays and lesbians gathering at Duarte Park following a homily in which the Cardinal deplored an alleged set of "aberrations" he said took place in the park on a daily basis. During the meeting with reporters this past Sunday and before his outburst the Cardinal was celebrating a decision by authorities to shut down several bars in the Santo Domingos' historic Colonial neighborhood. There have been several efforts by police authorities to shut down a number of gay bars in the zone as well. To date, I have yet to see any of the presiding Dominican governments raise a finger to counter the Cardinal's attacks against the Dominican LGBT community nor do I expect any of the police authorities that disrupted the march to be ever reprimanded or penalized for violating the LGBT community's human rights in plain daylight and as captured in camera. UPDATE: Apparently the issue of the rainbow-colored flag has enraged a number of influential leaders and media personalities eliciting apologies from the event organizers. Dominican Today reports that the incident has "sparked a wave of criticism in the media" and suggests that it's a "gaffe" that might "hobble a fledgling movement." They also say that the Dominican constitution does have a clause that says "the design of the nation’s flags is unalterable." On Tuesday, El Nacional said that even the organizers of the event were distancing themselves from the controversy over the rainbow colored flag telling a reporter that it wasn't their idea and that they could not control what participants were carrying with them on the day of the event even if they had wanted to. ASA president Leonardo Sánches says that he not only asked the individual who brought the flags to put them away but also said that he had asked the person to leave the caravan. Sanchez is quoted as saying that sometimes you had to "sacrifice some for the benefit of all". 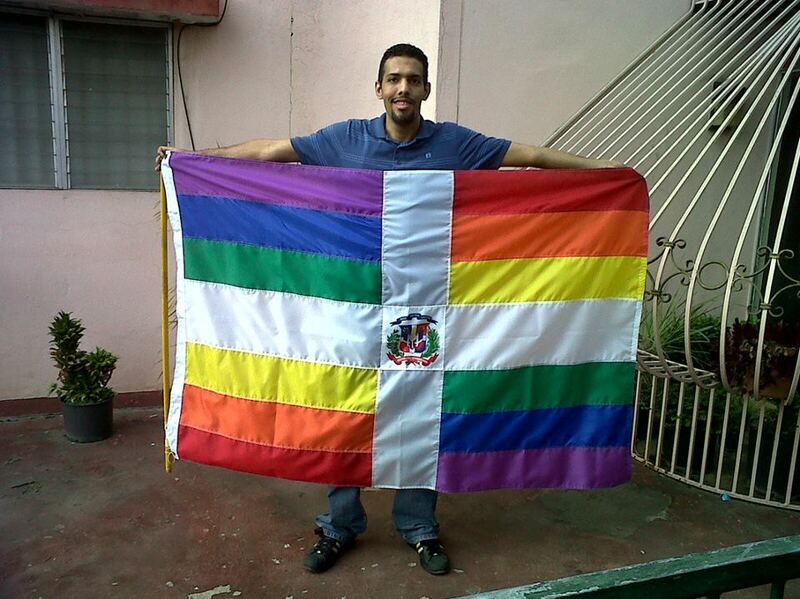 El Nacional also identifies Gióniver Castillo Santana as the person who designed the rainbow-colored flag and says that he continues to defend his decision and his right to show it. He argues that his new design does not attempt to replace the Dominican flag and is actually a brand new flag that incorporates elements from different flags in the same way the current Dominican flag was inspired on the Haitian flag which was inspired, in turn, on the French flag. He pointed out others have used individual elements of the Dominican flag for their own purpose without eliciting such an outcry including vendors who have put the flag's centerpiece coat of arms on key chains, t-shirts or decals used to decorate vehicles. The point of all this was that instead of giving activists more energy and valor it did the opposite and made them fearful. In a cowardly way, they wanted to destroy my flag instead because I had the balls to show it without fearing what could happen or what might happen to me... If the Dominican LGBT community is afraid of confrontation, of debating others and putting themselves at risk we will not achieve a thing. Many years from now we will finally have equal rights, not because we fought for them but because the countries that surround us will already have them and from the political pressure from those among which we will be the only ones missing. Extra: From Acento, their Spanish-language report on the caravan and their video report which includes interviews with transgender-rights advocates from Trans Siempre Amigas (TRANSSA).